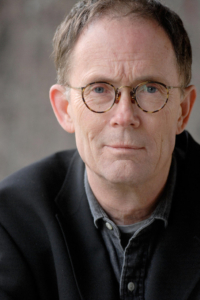 At some point during the ’80s, when the Net was becoming visible in a hazy, underdeveloped, primordial soup sort of way, William Gibson began interpreting it for us. This rather dubious honor was, no doubt, forced on the man as a result of the publication of the novel Neuromancer in 1984, in which Gibson describes a proto-internet he called “the matrix.” Despite bearing little resemblance to the Net that would emerge in actuality, Gibson’s matrix was a prophetic little incubator for future anxieties, and his description of it struck a chord. Now considered a classic of the genre, Neuromancer established Gibson as both a science fiction luminary and astute cultural critic. Ever since, Gibson has played the dual role of fiction writer and reluctant futurist. In interviews he often seems chagrined at this station (see below), consistently denying any thorough understanding of technology and claiming an amateur status when pressed. But few writers of fiction understand the contemporary moment like Gibson and fewer still can express the strangeness of inhabiting it with such lucidity. In early January, Putnam published Mr. Gibson’s first collection of nonfiction writing: the career-spanning Distrust That Particular Flavor. A wide ranging assemblage of essays, reportage, speeches and more, the book is an excellent chronicle of Gibson’s fascination with our past, present, and future (sorry if that sounds vague, but seriously, this thing ranges from Japanese otaku to Skip Spence’s jeans). Recently we spoke about Twitter, faulty metaphors, and pronoia. You’re primarily known as a novelist, but as Distrust That Particular Flavor attests, you’ve done plenty of nonfiction writing during your career. For you, how distinct are those two types of writing, the fictive and the non-fictive? Well, as I say in the introduction [to Distrust That Particular Flavor], fiction writing has become a sort of reliable altered state for me, at least when i get into it. It’s not always that easy to get into it, but when I do, It’s reliable. Doing journalism and writing essays, I sort of have an added level of anxiety because I’ve always felt, at some level, that I didn’t know what I was doing. I’ve never been trained to do that sort of thing and I felt that I had never adequately trained myself. That said, at the end of this tour, having read most of these pieces before live audiences, I think I’ve gotten over a lot my anxieties about that. Now I just accept that it’s something I do the way I do it. There are a lot of notes in the book about how anxious writing nonfiction makes you, but there’s plenty of really great stuff in there and It’s a lot of fun to read. Is that the type of response you’ve been getting? More or less, yeah. It’s been very gratifying, so I’m not as ambivalent about it as I was when I wrote that introduction. When you were writing these pieces and feeling apprehensive was there ever a sense of the advantages to being something of an amateur or an outsider? Mmmm, yes. Sometimes it’s an advantage to be doing something you don’t know how to do! Often that’s when you can really learn something, because you’re outside your comfort zone. I’m not by nature a person who is inclined to go outside my comfort zone, so when I take on some quasi-journalistic assignment and find myself outside it, just having to complete the piece is a valuable experience in itself. When I was younger, before I began to write, I just naturally had a lot of life experiences, as one does. But by the time I was writing, my day job involved being a father, and breadwinner, and I was doing it by writing fiction. That left me with an extremely quiet life. I mean, one needs a lot of peace and quiet to write fiction, and it’s not that easy to get when you have young children, so I think I would have gotten a lot less interesting external input if it hadn’t been for occasional nonfiction assignment. When you were starting out and you didn’t know how to be a journalist, how did you figure it out? Did you just act like what you thought a journalist should act like? Basically. It was sort of a “fake it ’til you make it” proposition, and I was never sure that I had, in fact, made it until I got to the end of the piece and the magazine would accept it. That seemed adequate. At one point in the book you mention that ‘unfiltered autobiography’ makes you uncomfortable. You also have one of the most impressive, active Twitter streams that I know of. Is there any conflict there for you, or are you able to square that immediate technological communication with a healthy private life? It hasn’t been a problem, I hope. I’m virtually free of the ‘too-much-information’ impulse! I don’t even tell people what I had for lunch, unless it was really especially good. Twitter is interesting that way because it doesn’t feel — I know it’s a public activity, particularly if you’re someone that people would recognize — but it feels to me like it has a sense of intimacy to it. It feels like you’re communicating with someone in particular rather than an audience. I haven’t really got a handle on it yet, but it’s an interesting thing. Every once in a while I’ll tweet something — and usually it’s humorous and involving some degree of word play or irony — and I’ll get kind of a wave of bafflement from the people who didn’t get it, or who took it literally. That always brings me up short a little bit, because it’s like, Oh, I’m not just sitting at a dinner table with a friend, having a conversation! I’m saying these things and people out there are utterly baffled by them. Yeah, it’s definitely a weird way to communicate. It’s like talking to one person, but in a crowd. Do you feel any professional duty to be on Twitter, or do you just feel that it’s an interesting way to be a writer in the world and communicate with your readers? Fortunately, it has been from the start a completely ludic activity. It’s like play, and if it had been presented to me as some sort of public relations chore that I should undertake I would have probably pretended to be unable to figure out how to sign up! I would have never have gone there. In fact, when I first got on Twitter, I expected I’d be on there for three minutes. I thought, Oh, these kids. This is some sort of awful Facebook-y thing and I’ll just check it out. That’s how I got stuck being @GreatDismal. I glanced at my bookshelf and there was a book about the Great Dismal Swamp so I put that down. And I’ve been there ever since. But it immediately struck me as a very amusing internet activity. Absolutely. I think that’s the only way I can tolerate it — as this weird, mostly silly exercise. Yeah. It’s just play. It works best as play. Except, on occasion, when something is actually happening in the world, it borders on becoming something else. The evening, in Pacific Standard Time, of the earthquake and tsunami in Japan was the strangest and by far the most intense experience I’ve ever had on Twitter. Someone I know through Twitter who lives in Tokyo tweeted this quick bit of broken panic, saying “Earthquake! Big one!” And I thought, Whoa! He’s joking. But I went to the US Geographic Survey Site and saw that there’d been a huge earthquake, just then, off the coast of Japan. So I went back and I tweeted that, and I gradually found myself spiraling into this strange situation where people in Tokyo whose cell service was down, because so many people were trying to use the phones, were using their wi-fi links and Twitter to try and figure out what was going on. So there was this bizarre group communication going on between people in Japan and people in other places advising them what to do, and it was so profoundly post-geographical. To be a guy in Cancun saying “No! You don’t want to take the Yamamoto line, it’s not running! You wanna do this…” Very, very strange. Wow. Thats’s wild. Have you seen Black Mirror, that British television show? No, I haven’t. I’m very interested in it, from what I’ve read, and I’m incredibly envious of the writer for coming up with that title. I watched the first episode last night. It’s this whole techno-paranoia, Twilight Zone setup and Twitter, Facebook, Youtube — all these agents of hyper-mediation — figure prominently in it. It’s going for a pretty realistic, near-future vibe, such as that in Pattern Recognition and Zero History. Charlie Brooker told The Guardian that while he was writing the show, he kept thinking, “If technology is a drug — and it does feel like a drug — then what, precisely, are the side-effects?” I was wondering what you thought of that metaphor: technology a drug and its side effects. Well, it’s not a new metaphor, and it has never been my metaphor of choice. The specific kind of emergent technologies we’re dealing with are more obviously cultures, or culture. They fit the slot where we used to keep culture perfectly. And my observation has been that, as soon as people become dedicated users of a new communications technology, they become part of the culture and are then unable to observe their use of that technology without observing it through the technology. That works better for me than the the drug metaphor. The drug metaphor is overused, I think. It’s applied to a lot of things today that aren’t, to my mind, really very drug-like. The metaphor doesn’t work both ways; there’s a faulty, seductive parallelism in it. Like, heroin does certain things, and it has certain side effects, but the things people do with heroin are not about communicating with other people! That’s a very good point. But I think Booker is talking specifically about paranoia as a side effect of these emergent technologies. One of the ways to test that would be to look for the corresponding pronoia, which is the opposite of paranoia. It’s the irrational belief that everything is happening for a good reason. There’s really quite a lot of that around on the internet and there’s quite a lot of it around in our culture. It’s, to my mind, a no more realistic way to view the world and life than paranoia is. Our use of the term paranoia is fabulously, very complexly and historically screwed up. We don’t really use it accurately. So, I don’t know. That would be too much of a lecture to get into now.